This is a fully functional gimbaled compass. It is made of high quality brass with a silver tinted finish. Each component is crafted with the finest craftsmanship. Compass, body, and tri-stand is made of solid brass while other parts are made of brass strip. Available in shiny brass finish and it comes on a solid brass tri-stand . 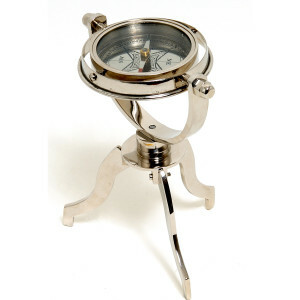 This compass is a great addition to any nautical collection.